"This event incorporates a gallery show, music, and performance as a gateway to celestial celebration." That image to the right is not a banana, but a plantain (in Spanish platano). 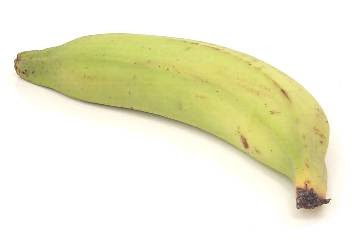 The plantain is most commonly eaten as a side dish in many Latin American cuisines, where it is simply boiled and then served as a side dish with perhaps a little olive oil and salt to add some flavor, especially if it's a green plantain, which are rather tasteless by themselves. The ripe ones are quite tasty and sweet, and are usually served sliced and fried. A few years ago you could only find them in Latin American bodegas, but now most major supermarkets carry them. But let's look at the green plantain. In most Latin American restaurants where it is offered, it is offered as a boiled side dish. In Cuban restaurants (and many Miami art galleries) it is also served as tostones, which essentially involves slicing up the plantain, frying it in olive oil for a while, taking it out and crushing it, and frying it again. Add salt and you're done. But Fufú is the real king of plantain dishes and it is rarely seen in any restaurants, even Cuban ones. I think that maybe it is because Fufú possibly developed in the eastern part of Cuba (a province once called Oriente), and it may not be as well known or served in Havana, which is the only place that most tourists visit. With its massive forests and mountains, a large African population from Spain's terrible slavery trade, coupled with its large French immigrant population which migrated to Cuba after the Haitian independence wars, and its concentration of Galician, rather than ethnic Castillians, Catalans, or Andalucian Spaniards, Oriente evolved into a very distinct region in Cuba, quite different from Havana and the other Cuban provinces, and so did its cuisine. Oriente is where Bacardi rum was invented, and where Hatuey beer was created, and where the mojito and Daiquiri were invented... get my drift? And in Oriente the humble plantain is eaten as a very delicious side dish called Fufú, with the accent in the last "u" like in Hai-ku.... foo fú! Start with a couple of green plantains. Wash then and cut out the tips of the plantains but leave the skin on. Cut the plantains into three equal pieces per plantain and bring to a boil in water and boil for a few minutes until the green skins start to peel away. While they are boiling, in a frying pan heat a generous dose of olive oil with a seasoning dash of salt and pepper (or Goya Sazon is you really want some exotic spices). Add chopped fresh garlic and chopped (very small pieces) onions to the hot olive oil and fry the garlic and onions; lots and lots of garlic. While the onions and garlic fry (don't overcook), the plantains should be ready, so pull them out, throw away the green skins and put the cleaned hot plantains on a large flat plate and mash them as you would do for mashed potatoes, but not to an extreme - they should be lumpy. Once they are broken up some, add the frying pan mixture of oil, garlic and onions and mash it all into the plantain mixture. Salt to taste and this culinary work of art is ready to eat! Deadline: May 15, 2009 5 P.M.
Boston's Fort Point Arts Gallery is seeking proposals for 2009 group shows and performances. Proposals are open to all media and shows will be selected by guest juror, Heidi Kayser, the founding director of both the Axiom Center for New and Experimental Media and the newly formed Art Technology New England Consortium. Submissions are due at the gallery by 5pm on May 15th. You can email questions to: gallery@fortpointarts.org.